Installing Kodi SportsDevil Addon: Is it safe to use? Are there alternatives? 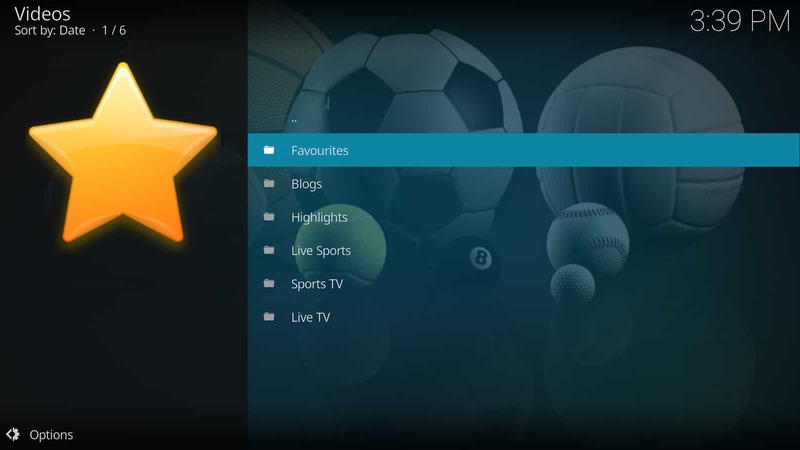 SportsDevil Kodi Addon: Should you install it? Is it safe? Are the better alternatives? Interested in the SportsDevil Kodi addon? This guide explains what SportsDevil is, how it works, and discusses some of the alternative sports addons available. Kodi is free, open source software that allows you to quickly and easily set up your own home media center. One of Kodi’s biggest draws is its versatility; it can be installed across a wide spectrum of platforms including PC (Windows, Mac, and Linux), Amazon Firestick, Amazon Fire TV, Android, iPhone, Roku, Apple TV, Raspberry Pi, and even USB flash drives. Kodi allows you to directly play any audio or video files that are stored on your device. However, there are limits to the amount of media each device can hold. This can be an especially large problem for mobile users due to their smaller internal memory capacities. To combat this, many Kodi users choose to install plugins named addons. These addons contain libraries of content gathered from websites and while they require an internet connection in order to function, they take up far less storage space. SportsDevil is a third-party Kodi addon that focuses on providing access to live sporting content. In this article we’ll be covering how SportsDevil works and exploring some of the privacy issues that all official and third-party Kodi addons share. Kodi itself is completely legal to use, but it has seen a lot of negative press coverage recently. This is because some third-party addons have been providing unrestricted access to copyrighted content. Copyright law can be confusing at the best of times, and what’s legal in one place may not be in another. For this reason, it’s important that you research and understand your country’s laws regarding streaming content online before attempting to use Kodi for this purpose. More and more people are turning to virtual private networks (VPNs) to keep their confidential data and browsing habits safe. Despite what certain copyright holders think, there are multiple reasons why a law-abiding Kodi user might use a VPN to protect themselves. Every Kodi addon is vulnerable to hijacking. Once this happens, there’s very little that an attacker can’t do with your computer. If they were to intercept your network traffic using a Man-in-the-Middle (MitM) attack, they’d even have access to all of your login credentials and browsing history. Even your own internet service provider (ISP) may be interested in selling your browsing data. Also, there have been several high-profile cases where ISPs have admitted to or been caught throttling their customer’s network speeds. A VPN can protect you from hackers and your ISP’s prying eyes. They work by encrypting all incoming and outgoing network traffic. This prevents most MitM attacks from happening and because your activities are hidden, your ISP can’t tell if you’re streaming video or not. With unthrottled speeds, you might find that your content plays with less buffering and stuttering. IPVanish is a popular choice of VPN among Kodi users. It works with every Kodi addon we’ve tested and has dedicated apps in the Android, Apple, and Fire TV app stores. This makes it one of the most portable VPNs available and allows you to remain protected regardless of which device you’re using. While all VPNs slow you down slightly, IPVanish offers faster, more stable connections than most other VPNs we’ve tested. Additionally, with servers in 55 different countries, region-locked content becomes incredibly simple to access. IPVanish works with all popular devices and is the easiest VPN to install on Firestick that we’ve tested. What is the SportsDevil Kodi addon? SportsDevil is a third-party Kodi addon. It gathers links to both live and on-demand sporting content and groups them in one place for easier access. While most Kodi addons either gather links or allow their users to connect to peer-to-peer (P2P) networks, SportsDevil does both. While the majority of its content is hosted online, certain links require the user to install additional third-party addons like Acestream or Plexus. This brings an increased amount of risk. Each third-party addon that is installed increases the risk that one of them will be hijacked. Additionally, in order to use P2P networks in Kodi, users have to allow external devices to access their Kodi installation. Considering how few videos require P2P functionality and that it provides an attacker another way to infiltrate your system, this risk is unnecessary and reckless. SportsDevil lacks even basic search functionality. Instead, you select a provider from one of several websites and are given a list of the sports that they cover. With many of the links broken, it could take a few attempts before you find a working stream, and even then, there’s no guarantee that it will remain online for any period of time. Most of SportsDevil’s content is taken from unlicensed sources. By watching these channels without paying, you remove the incentive for the broadcasters to continue airing the sports you’d like to watch. There are a handful of free to watch TV streams available, but many of these are accessible through safer and more importantly, official, Kodi addons. Finally, SportsDevil is often used as a dependency by other addons. This means that it may get installed alongside other third party addons. In truth, there are many version of SportsDevil around, and given that it exists in a large number of repositories, it could easily be hijacked by someone up to no good. For the reasons above, we do not recommend Kodi users install or attempt to stream content with SportsDevil. 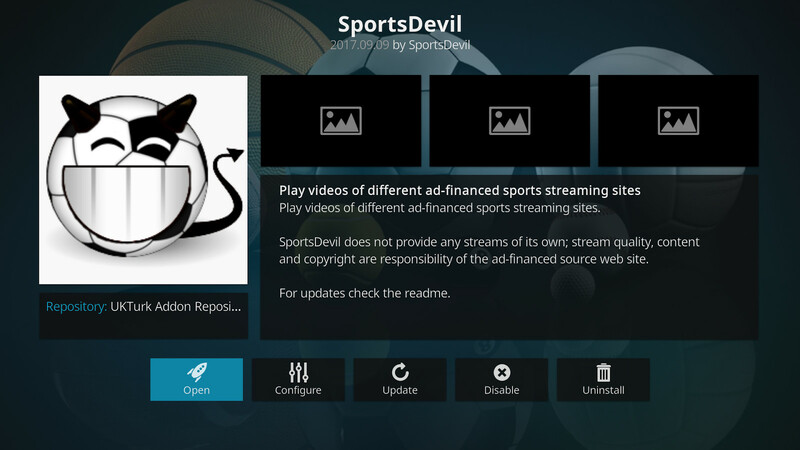 SportsDevil offers nothing to Kodi users looking to watch content from legitimate sources. However, there are several high-quality, legal Kodi addons that provide a better experience, not only in terms of the content itself, but in terms of functionality as well. NBC Sports is a subscription service that offers access to both live and on-demand sporting content. They provide coverage for a wide range of sports including hockey, boxing, and tennis. You’ll require an NBC Gold account in order to view the majority of its videos, but selected highlights and featured content can be watched for free without registering. NBC requires an American IP address to access most of their content, however there are selected subscription packages available to viewers in other locations (Austria, Canada, Denmark, Germany, Ireland, Italy, Japan, Luxembourg, the Netherlands, Spain, Sweden, Switzerland, and the UK). You can also pay to watch a single game in some cases. If you’d only like to watch the free clips, you can do so by connecting your VPN to an American server. 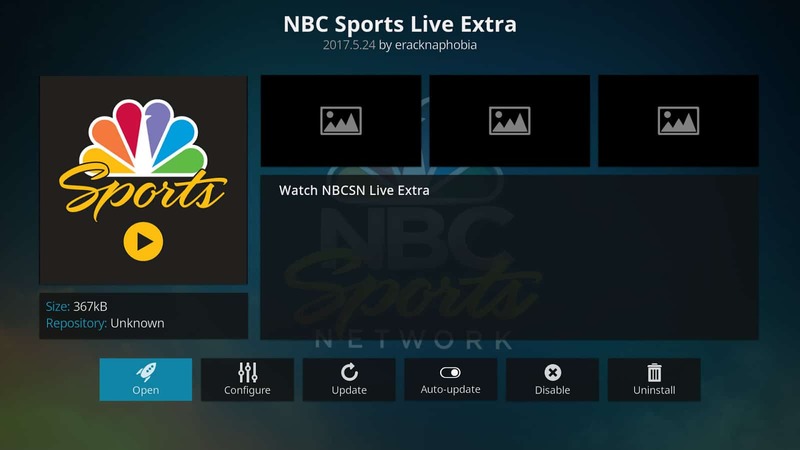 NBC Sports Live Extra can be found within the official Kodi addon repository. 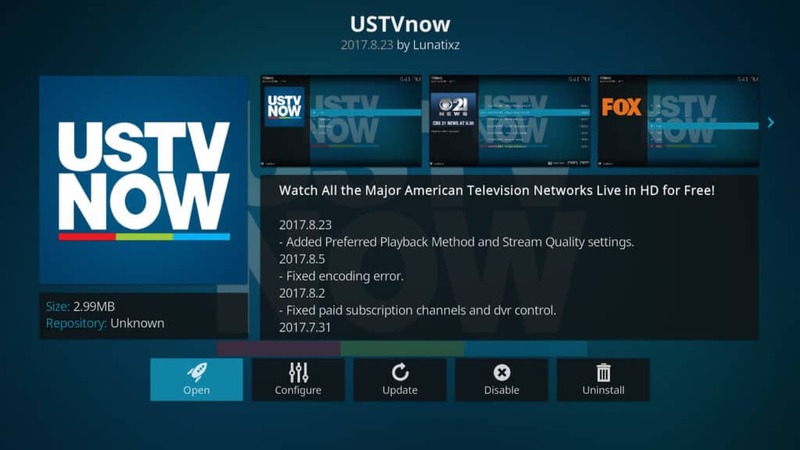 USTV Now is an online subscription service aimed at allowing members of the US armed forces to watch American TV while away from home. Despite this, you don’t have to prove your identity and while USTV Now claims to only allow viewing from within the US, its content is not region-locked. There is a free plan available that provides access to seven of the most popular network TV stations (CBS, NBC, FOX, etc) but a premium membership ($19 a month) unlocks a further 25 channels including NBC Sports, ESPN, and ESPN 2. The USTV Now Kodi addon maintains all of the functionality of the online service. There’s a TV guide that shows what’s on for each channel, and the more expensive subscriptions allow you to record shows as they air. USTV Now can be found within the official Kodi addon repository. Sportsnet Now is a Canadian streaming platform that provides access to live and on-demand sports. Hockey, baseball, and basketball are all covered, as are less popular sports like curling. This service costs $24.99 a month and an account is required to view any of its content with the Sportsnet Now Kodi addon. Sportsnet region locks their content, so Kodi users outside of Canada will have to connect their VPN to a Canadian server. Additionally, some games are only viewable if you reside in the area one of the teams is from. For instance, if you’d like to watch the Toronto Maple Leafs play, you’d have to connect to a server in Toronto or the surrounding area. 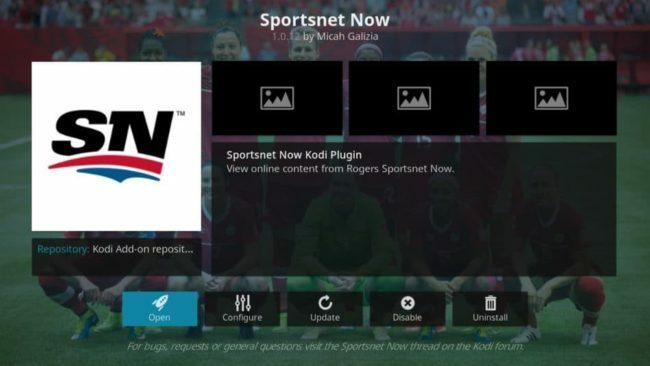 Sportsnet Now can be found within the official Kodi addon repository. SportsDevil lacks the structure and organisation that makes an addon with such a large content library easy to use. In addition, the fact that it gathers streams from unlicensed sources makes it a poor choice for Kodi users looking to watch sports legitimately. SportsDevil comes with more risks than most other third-party addons due to its inclusion of P2P streams. While installing the addons required to make these work is optional, it makes no mention of the vulnerabilities that they add to your system. This could lead users to think that P2P streams are safer than they actually are. We’ve explored the risks that these addons pose before and any Kodi user interested in using them would do well to research them more fully beforehand. SportsDevil isn’t entirely safe, even if you don’t watch its P2P streams. Third-party addons are usually not created with the same rigorous testing and vetting procedures that official addons are. As a result, they could contain more unpatched vulnerabilities for an attacker to exploit. The more third-party addons you install, the greater the chance that one of them will be hijacked. When you consider how many legitimate sources of sporting content there are, SportsDevil becomes far less attractive. Kodi users interested in minimizing the risk to their systems would be better served by one of the safer, legal alternatives we mentioned above.